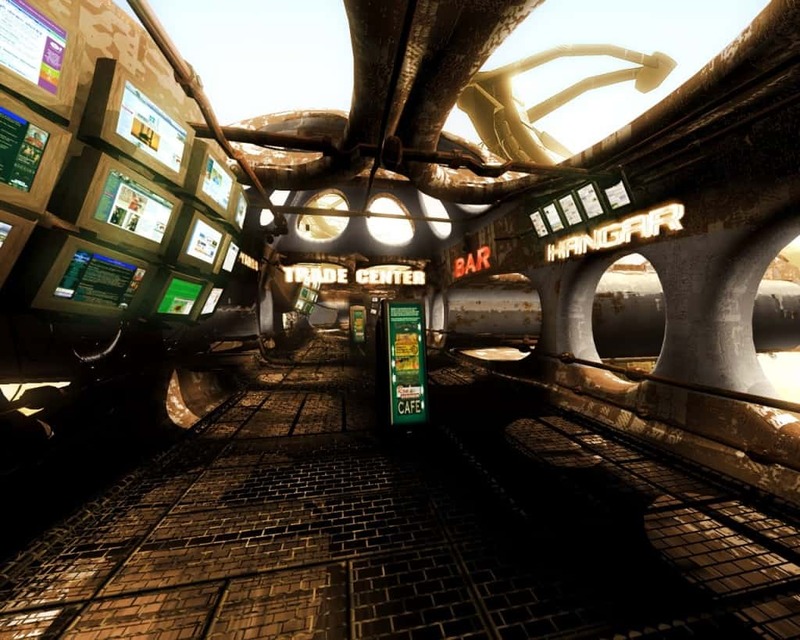 Off-world commercial sites in general, but particularly passenger transfer terminals, quickly teach first-time interstellar travelers the value—and often the necessity—of carrying universal credits. National currencies, no matter how well regarded they are on Earth, are collectively too diverse and too hard to exchange to be practicable for off-world merchants. Conversely, while universal credits are rare on Earth, they become increasingly common as one travels further away from the electronically-linked economies and banking systems of the home planet. By the time a traveler has reached the Green Mains, Earth-based electronic credit or debit cards become functionally useless, since account and balance verification usually takes at least six weeks from Epsilon Indi, and considerably longer from points further down the Mains. Eureka Downport’s “omniterminal” on Alpha Centauri III/Terra Nova.